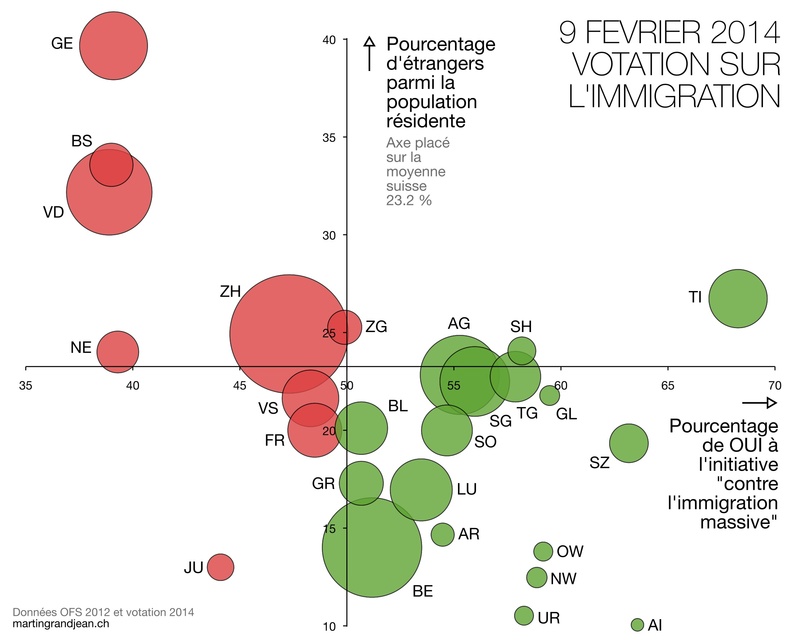 Last sunday Feburary 9th, Swiss people were asked to vote “against mass immigration. Some people have advanced the hypothesis that Cantons in which there is a high percentage of immigrants, they would vote in support of developing laws to prevent mass immigration. This graph seems to show quite the oppoisite! Beside the exception of Ticino, cantons which have high immigration rates, such as Geneva, Basel, Valais and Neuchatel voted against the implementation of laws to prevent mass immigration. On the contrary, in Cantons with low immigration rates, such as Schwyz and Appenzell Innerrhoden (which was also the last Canton to grant women the vote in 1991!) up to 65% of the population voted to develop measures to block mass immigration. Are you surprised? Actually numerous studies show that the people are afraid of what they don’t know… so the more contacts and exposures you have with foreigners, the more you appreciate them. Here you can find the link to the Prezi presentation for the module Mastering Intercultural Communication, which I’m teaching at the University of St. Gallen for the executive school, Management for the Legal Profession. The suggested reading for the module is: Samovar, L., Porter, R., & McDaniel, E. (2011). Intercultural communication: A reader. Cengage Learning. Our latest case study can now be found on The Case Centre website: it focuses on Intercultural Communication issues in managing a multicultural work force in a public school in Thailand. The case portrays the real story of a young American who takes an educational job in South East Asia. The story narrates the cross-cultural challenges associated with the interaction of foreign teachers with the local administration of the public school in Thailand. Shane, despite having lived for two years in Thailand and being fluent in the language, is surprised by the local management practices: he was often asked to conduct a number of extra-curricular activities which were not outlined in his work contract, such as organising trips for the students, setting up an English club or supervising students who were preparing for a singing competition. Shane feels overwhelmed by the collateral activities, and frustrated when he is often interrupted during class for what he considered trivial reasons. A critical incident evolves when all teachers are asked to participate in decorating the school for the upcoming conference of local schools. The major argument between Shane (as the spokesperson of the foreign teachers) and the Thai administrators, helps to shed light on the causes of the mutual misunderstandings. These episodes help learners gain insights into cross-cultural management, different leadership models across cultures, and intercultural communication challenges which persist beyond language issues and knowledge of the local culture. Through the case, the readers can learn about typical sources of cross-cultural misunderstanding when Westerners and Asians collaborate, with particular focus on the public education sector. By analysing the case, readers should identify the major critical incidents occurred, explain their underlying causes making reference to theories of cross-cultural communication and management, and propose best practices and strategies for conflict resolution. Special thanks to Kyle Rydalch for writing this wonderful case! You are currently browsing the Sabrina Bresciani blog archives for February, 2014.